Inducted 1999. Enjoyed Lengthy Career in Minor League Baseball During 1940’s. When he was a fifth-grade student at St. Mary School in Quincy, Niemann knew what he wanted to become – a big league baseball player. He never reached his goal, but he still enjoyed a remarkable career in the sport. 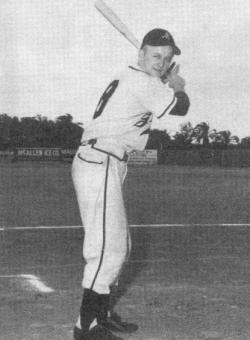 Upon graduation from Quincy Notre Dame in 1946, Niemann had a chance to sign a contract with a New York Yankees farm team but instead opted to play one year at Quincy College. The following year, at age 18, Niemann turned professional and signed with the Oilers of Henderson, Texas, in the Lone Star League. He was later transferred to the Del Rio Cowboys of Del Rio, Texas, in the Longhorn League. The next season, Niemann moved up to the McAllen Giants in McAllen, Texas, of the Rio Grande Valley League. Niemann, a left-handed center fielder and first baseman, then moved on to play for the Quad Cities Quads in the Three-I League in Davenport, Iowa. In 1951, the big leagues were becoming a reality, and Niemann was about to sign with either the Cincinnati Reds or the Washington Senators. However, he was drafted to serve in the Korean War. Upon his return from the war, his chances for a big-league career were gone, though he did play semi-pro baseball for a few years. Niemann did play in some oldtimer games alongside such baseball stars as Bob Feller, Lou Boudreau, Lefty Gomez, Ernie Banks and Minnie Minoso. Niemann was part-owner of a Yankee franchise, he served as an officer for the Quincy Cubs of the Midwest League, and he sponsored the Quincy Rivermen of the Central Illinois Collegiate League for three years. He was inducted into the CYO Hall of Fame in 1986. Niemann retired from Niemann Foods in 1997 and is at home with his wife Rita on the family farm. They have seven children – Ferd III, Nick, Nan (Wood), Jill (Stegeman), Tom, Drew and Paul – and 21 grandchildren.